Bubbles make everything better, especially when you add them to this five-ingredient Sparkling Cranberry Gin Cocktail. We can think of no better way to kick off the weekend than with a glass (or two!) 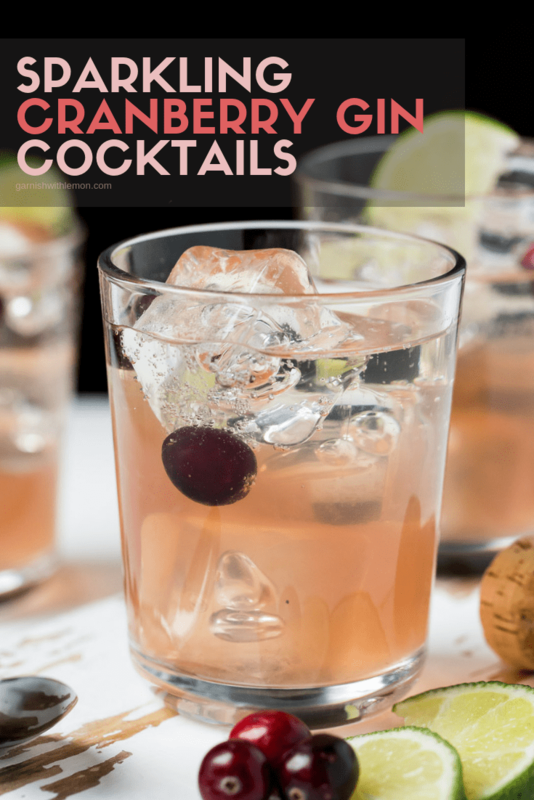 of this Sparkling Cranberry Gin Cocktail. 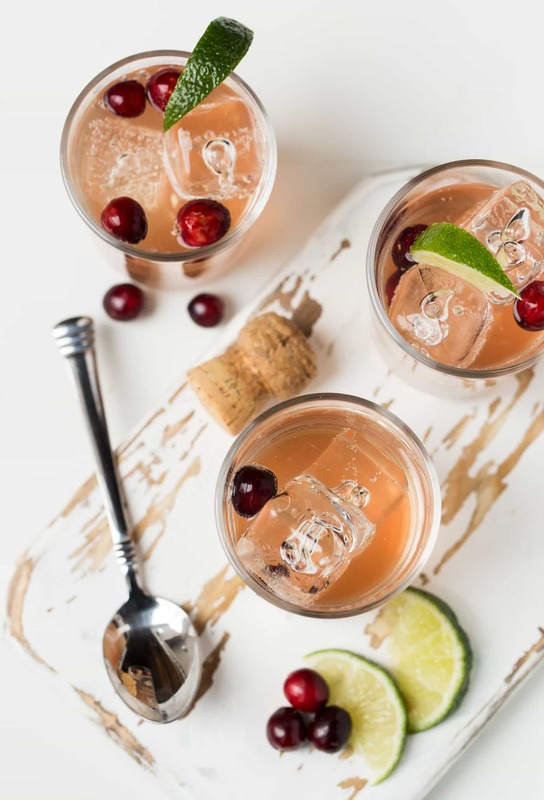 This simple, refreshing gin cocktail is not only easy to make, it looks extra fancy when dressed up with fresh cranberries and lime wedges – the perfect way to add a little style to your holiday happy hour. What ingredients do you use to make this Sparkling Cranberry Gin Cocktail? This drink has a little bit of tang to it thanks to the fresh lime and cranberry juices. A touch of simple syrup and generous pours of gin and Prosecco keep everything balanced. Plus, with only five easy-to-find ingredients, this Sparkling Cranberry Gin Cocktail couldn’t be simpler to throw together – always a bonus during the hectic holiday season. A quick word about cranberry juice. You will get a range of hues in this Sparkling Cranberry Gin Cocktail depending on the cranberry juice you use. The pale color you see in these pictures almost looks like grapefruit juice, but it’s actually from organic cranberry juice. If you buy a conventional cranberry juice, you will notice a more vibrant color in your cocktail. Either ingredient works here; it’s merely a color preference. Ugh! Not a gin fan. Can I make this Sparkling Cranberry Gin Cocktail with vodka instead? Bonus! You can easily turn this cocktail recipe into a batch-style Sparkling Cranberry Gin Punch. Hosting a crowd? Simply multiply the recipe by the number of guests and add the chilled ingredients to a punch bowl right before guests arrive. Make sure to set out a bucket with ice for guests to add to their glasses before serving themselves. Of course, you don’t need to save this Sparkling Cranberry Gin Cocktail just for the holidays. I can see myself sipping this thirst-quencher well into winter. Try a glass tonight; I bet you’ll agree with me. 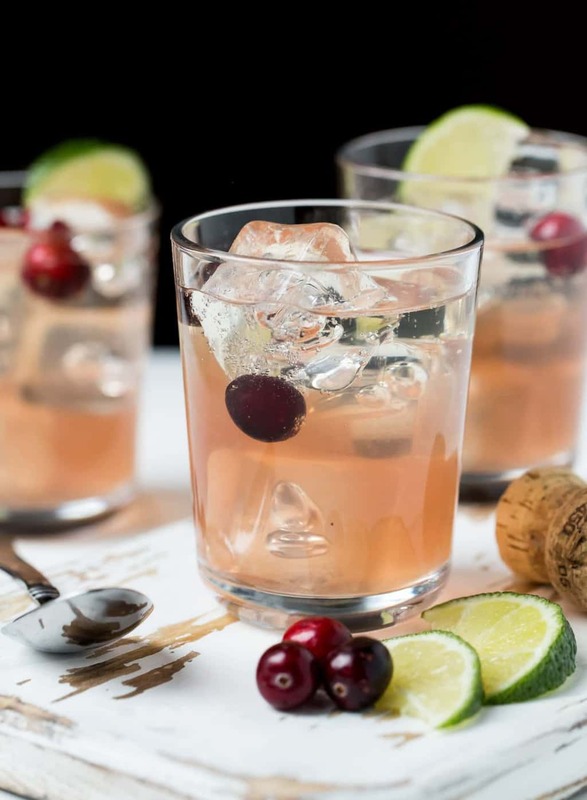 Toast the holidays with this 5-ingredient Sparkling Cranberry Gin Cocktail! Add all ingredients to a low ball glass filled with ice. Stir gently. Garnish with fresh cranberries and lime wedges, if desired.